Potsdam has a notable place in the history of both Germany and Europe. Today it is the capital city of the German state of Brandenburg but until 1918 it was that the Prussian Kings and German Kaisers had their summer residences. These splendid neoclassical palaces and parks, along with their equally grand counterparts in Berlin, make up Germany’s largest UNESCO listed World Heritage site. During the 20th century, it was here that the Nazis staged a ceremonial event where President Paul von Hindenburg and the new Chancellor Adolf Hitler shook hands symbolising a coalition between the old guard and Nazism. Twelve years later in August of 1945 Truman, Churchill and Stalin met in Potsdam to discuss the future of postwar Europe, a meeting which ended with the Potsdam Agreement and the Potsdam Declaration. With all this history and at only an hour or so on the S-Bahn, Potsdam is a popular day trip from Berlin. 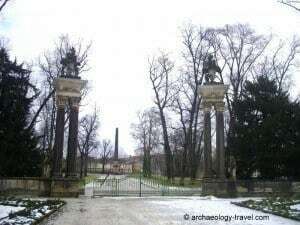 Sans souci, 'without worries' - to where Frederick the Great would escape the Berlin Court. Choosing to visit Potsdam when the region was in an icy grip, was not one of my better choices of things to do while in Berlin. I had chosen to take a bus tour of Potsdam from Berlin as I desperately wanted to see the Roman Baths, the Chinese House and the Egyptian Obelisk in the Sanssouci Park. On the day it was only drizzling on an off. The pick up point was a short walk from my hotel, and the bus ride to Potsdam was pleasant enough with an interesting commentary pointing various landmarks along the way. By the time we reached Potsdam it was drizzling but only lightly. After the bus tour of the city I decided to risk it and got of the bus. I crossed the road, entered the park and started walking down one of the many tree lined paths – quite striking even in their winter bleakness. And that is when the heavens opened. I looked back and the bus was already way up the road. I got drenched, and no photographs. But I still saw what I wanted to see. 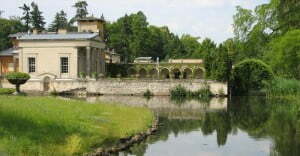 And have no hesitation in recommending a day trip to Potsdam for anyone visiting Berlin. Particularly if Neoclassical fantasy is one of your interests – Potsdam has it all. 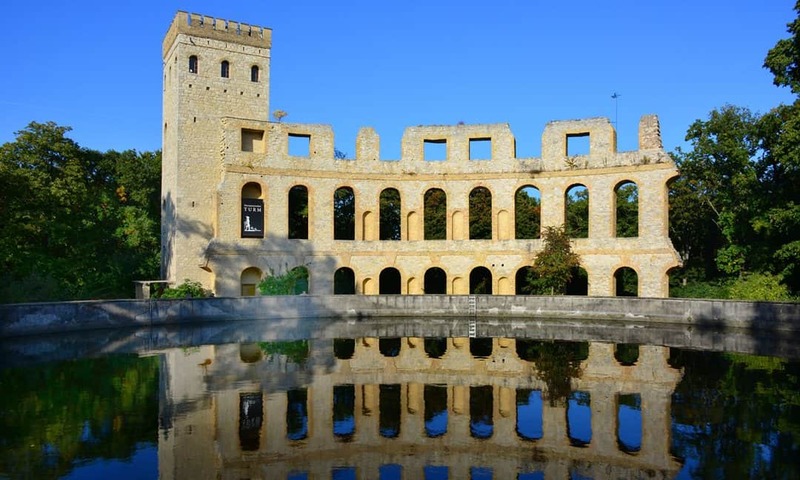 The Roman ruins (copying the Colosseum in Rome) and Norman Tower next to the water tank on Ruinenberg. Potsdam is the capital city of the German state of Brandenburg but until 1918 this is where a succession of Prussian Kings and German Kaisers had their summer residences. These splendid neoclassical palaces and parks, along with their equally grand counterparts in Berlin, make up Germany’s largest UNESCO listed World Heritage site. The Roman Baths in Sanssouci Park. 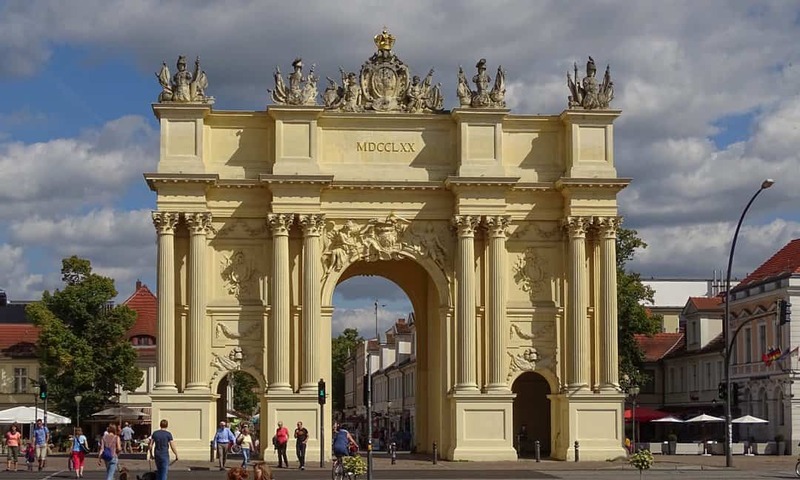 One of the reasons I wanted to visit Potsdam was because it seems to have been something of an architectural playground for Frederick the Great (1712 – 1786), and some of the Frederick Williams that were to follow him. Not only are the royal palaces and gardens slightly over the top with their neoclassicism but these kings did not stop with the usual elements originating in Classical Greece and Rome. They brought in features from all over the then known World. Fountains and neoclassical statues are everywhere, as are clusters of Greek and Roman columns invoking ruined grandeur. In one corner of Sanssouci Park are the Roman Baths. These really are unlike any Roman bathhouse I have ever seen, more like a villa. Not far away is an incredibly ornate garden pavilion known as the Chinese House. On the edge of the park, and on the banks of the Havel River is a reconstructed mosque – it houses the steam pump that provided water for the fountains; a replacement for the failed water tank built next to the Roman ruins on Ruinenberg. But perhaps one of the more amusing features is the supposed Egyptian obelisk erected at one of the gates to the park. In 1747 Frederick the Great ordered an exit to be made for the park. Neoclassical columns were placed either side of the gate itself, and an obelisk nearby. Unlike the obelisks in Paris, London or Rome, this particular example was specifically made for the king, not brought in from Egypt. Although decorated with Egyptian hieroglyphs, anyone who has some familiarity with Egyptian hieroglyphs will immediately notice that there is not something quite right about them. This is because they are totally meaningless; the obelisk was created long before the hieroglyphs had been deciphered. Perhaps the designer thought it would never happen. Potsdam and Sanssouci really is a crazy mix of … everything! But a must for anyone who enjoys the excesses of neoclassicisms and the follies of European royalty; not surprisingly comparisons are made with France’s Versailles. 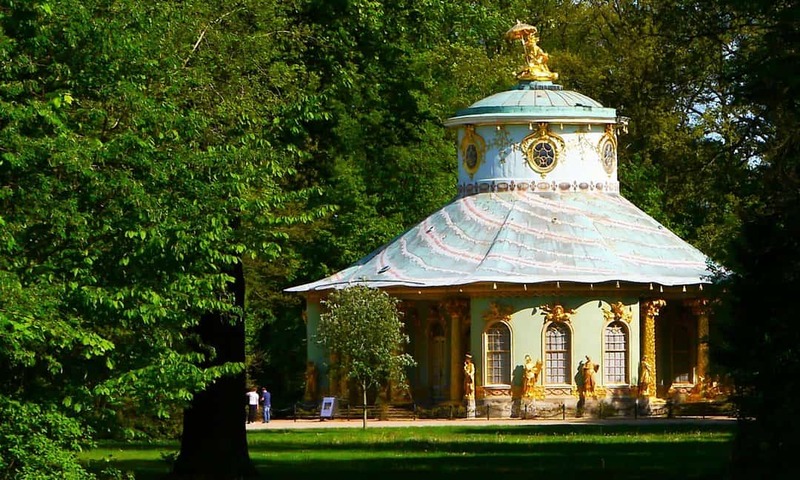 The exquisitely decorated Chinese House in Sanssouci Park. People have been living in the Potsdam area since at least the Bronze Age. As a settlement, however, it is thought to have been founded in the 7th century by the Slavs. The first written documentary evidence is in 993 AD when the area was given to the Quedlingburg Abbey by Emperor Otto III. In 1415 Postdam passed into Hohenzollern possession, and it is under the Prussian royal family that it developed into a powerful city. A significance that was more than symbolic during the lead up to and ending of World War II. 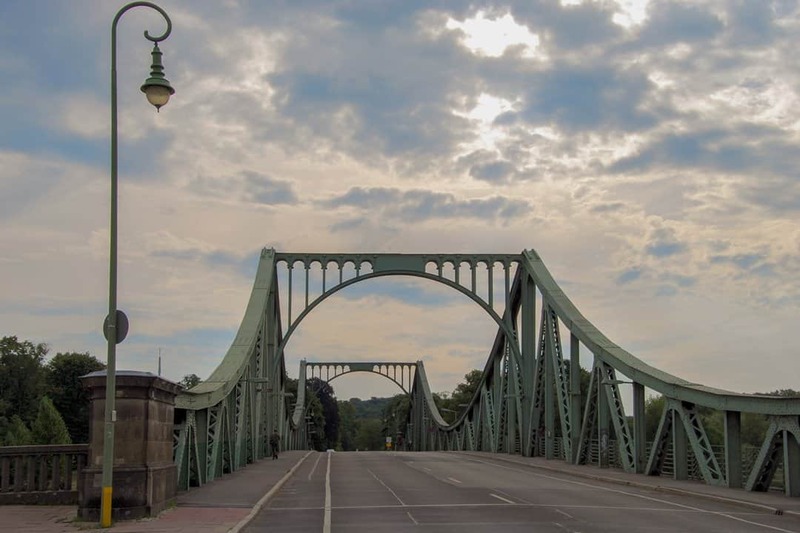 Germany’s ‘Bridge of Spies’, on which the US and the Soviets exchanged high value prisoners. The popular image of the US and the Soviets exchanging prisoners on a bridge is not just an invention of Hollywood film producers. It actually happened, here on Glienicke Bridge. The first exchange took place in 1962, and the last in 1986, during which time a total of 40 people are on record as having been exchanged on this bridge. Built between 1914 to 1917 in the style of an English Tudor manor house, this is the last of the Hohenzollern Palaces. It was here that the leaders of the United Kingdom, the Soviet Union, and the United States met in 1945 to discuss the future of post World War II Europe and Asia – known as the Potsdam Conference. Named Alexandrowka in memory of Tsar Alexander, this quaint ‘Russian’ village was built Prussian King Frederick William III to commemorate good relations between Prussia and Russia at the time of the death of the Tsar in 1825. It housed the Russian singers in Frederick’s choir. Frederick William I had over 100 houses built to house the Dutch craftsmen he brought to Potsdam in the 17th century. Today this is a lovely and picturesque part of the city with bars, cafes and shops. Built by Frederick the Great, or Frederick II, in 1770/1 to commemorate his victory in the Seven Year’s War. Hence why it is modelled on a typical Roman triumphal arch. Take a close look at both sides, they are quite different. The city side was designed by Carl von Gontard, while his pupil, Georg Christian Unger, designed the outer side. The two side pedestrian entrances were only added in 1843 because of the increase in pedestrian traffic. AT one of the main entrances to the Sanssouci Park is an obelisk with Egyptian hieroglyphs. This was not brought to Postdam from Egypt, as those in Rome and the Vatican were. It was specially made for the park. But as it was created before hieroglyphs had been deciphered, they do not make any sense. Keeping with the Egyptian theme, a pyramid was constructed in the New Garden in 1791. Ruinenberg is a hill to the north of Sanssouci Park. It was on this tank that Frederick the Great had a water tank constructed to supply the water features of Sanssouci. The tank was decorated with ‘ruins’, the ruins of a Norman Tower and wall looking very much like the Colosseum in Rome. Built to look like a mosque, this pump house used a steam engine to draw water from the Havel River to supply water in the mid 1800s to the various water features in Sanssouci Park. Although Einstein never worked here, he approved of its construction. The tower was built between 1919 and 1921 to house a solar telescope for use in experiments on Einstein’s theory of relativity. Tours of the tower are possible. Potsdam is easy to get to, and just as easy to get around. But see this list if you are looking for organised tours and activities in Potsdam. 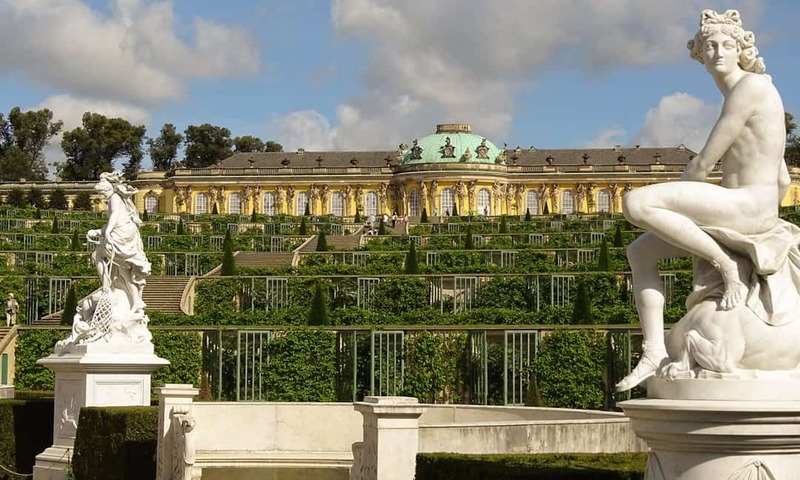 When is the Best time to Visit Potsdam & Sanssouci? Faux Egyptian obelisk, Sanssouci Park entrance. As much as I enjoyed my visit, I really do not recommend this as a winter day trip. Unless of course you are just wanting to see the interior of a few of the palaces. Many of the features in Sanssouci Park (such as the Chinese House and the Roman Baths) are closed, leaving only the bigger Sanssouci and Charlottenhof palaces to open to the public at this time of the year. The park itself is obviously quite bleak during winter, but made all the more unappealing by the boxed-up statues (understandably to prevent them being damaged in the extreme winter temperatures). And wondering around the park in the freezing rain is not my idea of a great day out! But, even in the bleakness of it all, anyone with a bit of imagination can see Sanssouci Park, the various features and the royal palaces must look stunning at other times of the year. From the various images I have seen of the palaces and gardens in Potsdam, late spring and summer would be much better, perhaps even early autumn. And we should bear in mind this was Frederick the Great’s summer residence … for good reason. The outer, field side of the Brandenburg Gate, designed by Georg Christian Unger. Without question, I would like to return to Potsdam, but only in late spring or summer – which would give an added bonus of longer days. If I do not stay in Potsdam for a few days (I think there is that much to do and see to warrant a few days), and only take a day trip from Berlin, I will get a Berlin Welcome Card that includes Zone C – which will includes travel on the S-Bahn to Potsdam. The journey is under an hour, and the station in Potsdam is quite central with Sanssouci Park and the many other attractions in Potsdam within easy walking distance. If, however, you have reduced mobility and walking around the city is not feasible, or you are quite happy and comfortable on a bus tour, a bus tour to Potsdam really is a good option (have a look at this list of day tours to Postdam from Berlin). You get on the bus in the centre of Berlin (often there are a few points of departure to choose from – once you buy your ticket you will be given all the necessary details) and then enjoy a wonderful drive through German countryside to Potsdam. The journey passes by some interesting cultural landmarks, including Filmstudio Babelsberg – the World’s oldest large-scale film studio. Also, the route itself has a historic element. One of the stretches of autobahn was once the Automobil-Verkehrs – und Übungsstraße (Automobile traffic and training road), which is Europe’s oldest controlled-access highway that was until 1998 used as a motor racing circuit; you get to see one of the spectator stands. The bus I was on was equipped with an informative and engaging audio-guide, which includes the various sites passed during the journey to Potsdam and then obviously the attractions scattered around the historic city itself. Once in Potsdam, you are given the opportunity of getting off the bus and exploring the town or the park on foot. But you only get a few hours, before you can either get on the bus back to Berlin or, as I did, make your own way back via the S-Bahn (an extra cost unless you have a Berlin Welcome Card that includes travel in Zone C). 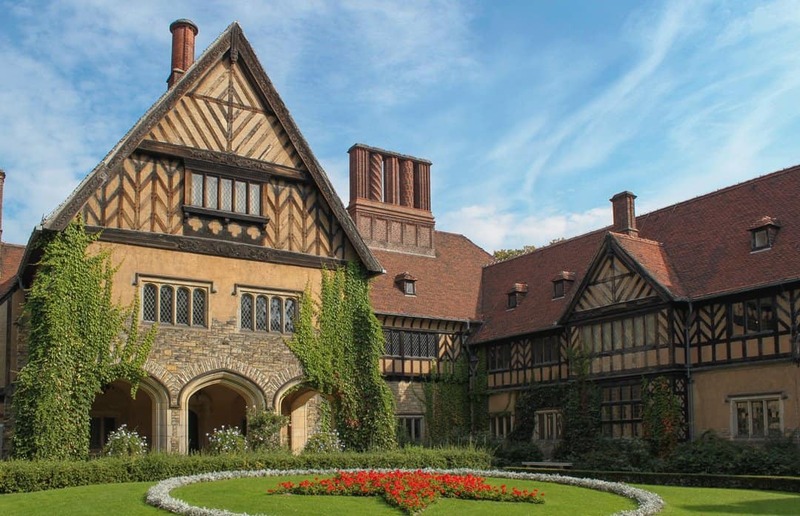 The commemorative courtyard of Cecilienhof Palace, with the Soviet red star set out with flowers.